Dr Parvinder Kaushal born on 01 .04.1957 at Village Kahnani Teh, Nalagarh, Distt. Solan. 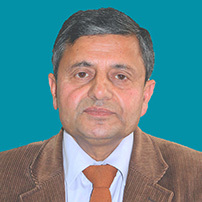 Himachal Pradesh is presently working as Regional Director/Coordinator. National Afforestation and Eco-development Board at Dr YS Parmar University of Horticulture and Forestry, Nauni. Solan (HP). He has done M.Sc. Forestry from Solan and Ph.D. Forestry from Nancy. France with First Class. He has been actively involved in teaching. Research & development. Extension and administration for the last 35 years. He has served different Institutions/Universities in different capacities during this period. He has worked with Indian Council for Forestry Res. and Edu. Dehradun (1979-1981), Punjab Agri. University, Ludhiana (1981 -1992) as assistant and Associate Professor and as Dean. Faculty of Forestry at Birsa Agriculture University. Ranchi, Jharkhand (2005-2009). He is recipient of National Award for young scientist in 1989, and Himachal Shri Award in 2014. He was also awarded French Govt. Fellowship for Doctoral research 1984. Dr.Parvinder Kaushalh as published more than 100 research papers and technical reports and has written 13 book chapters/manual. He has participated in 26 world congresses and international conferences and has handled 63 projects. He has visited France, Italy, United Kingdom. Mexico. Austria. Germany. Switzerland, Yogoslavia, Belgium. Holland. Spain. Estonia. Canada. Finland. Turkey. Malaysia and Sri Lanka for presentation of papers and in exposure visits. International Leadership in Research: He has served as Deputy Leader of International Union of Forest Research. Organizations (IUFRO).H.Q., V ienna. Research Group on “Forest Stand Establishment Operations and Techniques” (2000-05). He had been Chairman of IUFRO working Party on Plantations Establishment (1990-2000). National/International level committees: Dr Parvinder Kaushal has served as member of the Regional Deans Committee for South Asia 2009. Member of National Core (ICAR) to review and restructure PG course curricula in Agricultural Sciences and convener or the Broad Subject Matter Area Committee (BSMA) in Forestry ICAR 2007: member of Quinquennial Review Team (QRT). ICAR for Indian Institute of Natural Resins and Gums (IINRG) for 2001-2007. Member of the Peer Review Team (ICAR Accreditation Board) for accreditation of Sher-e-K ashmir University or Agricultural Sciences & Technology, Srinagar. 2008: member. Search Committee to recommend a panel for appointment of Vice-Chancellor, University of Agriculture and Horticulture Sciences, Shimoga, Karnatka in 2013: Mernber, various UGC expert committees on Agriculture, Horticulture, Forestry, Environment. skill development etc. 2013-2016 contd. and member Research Advisory Committee constituted by Indian Council For Agricultural Research for ICAR – Central Agro-forestry Research Institute Jhansi. U P (2015- 2017). Research Management and Coordination: As Director/Coordinator of the Centre at the Regional level and Deputy Leader of the – IUFRO Research Group at the International level. The effective coordination of research and programmers was done. In project studies and for holding of workshops, Seminars, etc. proper	coordination was maintained with different institutions/organizations and with officers and individuals at different levels. In the Regional Centre of the National Afforestation and Eco – Development Board. The research Projects are planed, formulated and the founds are procured for their implementation. The projects have national/regional dimensions. As Dean of the Faculty, Ranchi, BAU the research and extension was strengthened in addition to teaching in the departments of the Faculty. Projects on Bamboos & Medicinal Plants, mined areas etc. were procured due to their importance in the Eastern Region.